Velour Shawl Collar Robe - 48 inches long from the back collar to bottom hem, 59 inch sweep at bottom, 2 pockets, double belt loops, roll up cuffs, and in 12 oz. 100% Cotton, triple sheared, luxurious Terry Velour fabric. 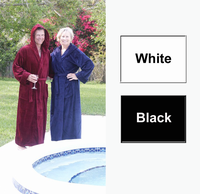 This luxurious robe One Size fits Men 150-200 lbs. and Ladies 150-190 lbs. Imported. Colors: White, Navy, and Black; Pink is no longer available from our vendor.